Three’s Mobile Wi-Fi Hotspot (currently the Huawei E5573bs-322) gives you unlimited 4G data on up to 10 devices for £22/month. If you’re looking to get connected to the internet whilst you’re on-the-go from devices like your laptop and tablet, it can be useful having a 4G portable wi-fi hotspot (sometimes also known as a “Mi-Fi”). Three is currently offering the Huawei E5573bs-322 Mobile Wi-Fi hotspot with unlimited data for £22/month on a 24-month contract. The device is also available on a range of shorter 12-month and 1-month contracts, in addition to being available to use on a Pay As You Go basis. 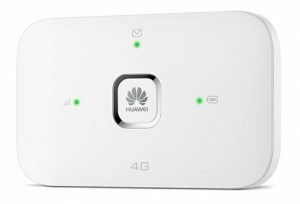 In this article, we’ll review Three’s Mobile Wi-Fi Hotspot service, including the price plans available and the Huawei E5573bs-322 hotspot. We’ll look at how this compares to other mobile broadband solutions, including tethering from your smartphone or using a mains-powered device like the HomeFi or the Huawei AI Cube. We’ll also look at the coverage and download speeds available when using a MiFi on Three. The Mi-Fi allows you to access 4G broadband on devices like your laptop or tablet. In the UK, Three has offered the “Mi-Fi” (or mobile wi-fi hotspots) as a way to get online from multiple devices since 2007. More than 10 years on, the Mi-Fi is still going strong, and is currently available in the form of the Huawei E5573bs-322 Mobile Wi-Fi hotspot. Customers signing up for the Mi-Fi service can choose from a range of Pay Monthly and Pay As You Go plans. At the high-end, it’s possible to get unlimited data for £22/month on a 24-month contract. This comes with no limits on how much you can download. For greater flexibility, a range of 12-month and 1-month plans are also available with up to 40GB of data per month. It’s also possible to use the Mi-Fi on a Pay As You Go basis, with the device costing £39.99 with 1GB of preloaded data. * Customers with a Mi-Fi on Pay As You Go can use the Data Reward plan. This offers 200MB of free data per month, with further usage costing 1p/MB. Go Binge is included on all Pay Monthly plans with at least 15GB of data per month. This gives you unlimited data for use on Netflix, TV Player, Snapchat, Soundcloud, Deezer and Apple Music. Usage of these services will not count towards your normal download allowance. Go Roam is also included on all Mi-Fi price plans (including Pay As You Go), allowing you to roam in 71 destinations at no extra charge including most of Europe, the USA, Australia and more. The latest in a long line of Mi-Fi devices is the Huawei E5573bs-322. It’s a battery-powered 4G hotspot, giving you access to internet on-the-go from up to 10 devices at one time. According to Huawei, the hotspot’s 1500mAh battery can give you up to 4 hours of battery life in operation. In practice, however, the actual battery life you get could be less than this especially if you connect multiple devices to your Mi-Fi or if you’re using the service in an area with poor coverage. When the battery runs out, you can recharge it through a micro-USB cable (one is included in the box). The hotspot supports Category 4 LTE connectivity, with download speeds of up to 150Mbit/s and upload speeds of up to 50Mbit/s. In reality, the actual speeds you’ll get will be much lower than this: typically more like 15Mbit/s but this will vary depending on your location and the strength of your mobile signal. The hotspot weighs 75g and has three LED indicators on the front of the device giving you information about your mobile connection, unread text messages and battery life. There’s also a slot to insert a micro SD card of up to 32GB in size. 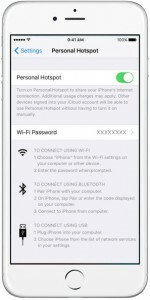 For the vast majority of users, it should no longer really be necessary to have a separate, independent mobile wi-fi hotspot. The chances are your existing smartphone already has tethering functionality which can be used to share a mobile broadband connection with other devices. By tethering from your smartphone rather than using a separate mobile wi-fi hotspot, you’ll be able to use your existing mobile data plan with no additional charges (assuming of course that your mobile phone tariff supports tethering). Furthermore, as it utilises the smartphone you already have with you, there’s no need to carry round a separate device or to remember to charge the Mi-Fi each time before you go out. If you’re mainly looking to use the service at home, the HomeFi is a much better option. 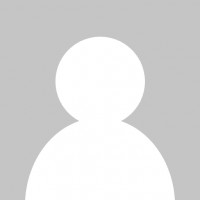 If you mainly want to use your mobile broadband connection at home or where a mains power connection is available, we’d strongly recommend going with the HomeFi or with the Huawei AI Cube router instead of the MiFi. Like the MiFi, the HomeFi is also available with unlimited data for £22/month (the AI Cube is a little more expensive at £25/month). With a mains-powered router, you’ll get much better performance as there’s no need for the device to optimise for battery life. You’ll also get a larger built-in antenna for better coverage, along with a SMA socket on the HomeFi for attaching an external antenna. The HomeFi and AI Cube also have extra features like an Ethernet socket for connecting wired devices. The AI Cube has built-in Amazon Alexa smart speaker functionality, and supports faster Category 6 LTE download speeds (up to 300Mbit/s download). You can read our full review of the Huawei HomeFi and the Huawei AI Cube B900 for more information. A battery-powered MiFi can still be useful in some situations. 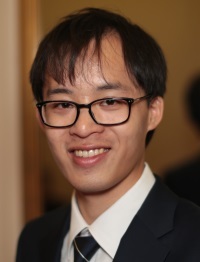 For instance, it can be useful if you’re not able to tether from your smartphone or if you’d like a separate device that will purely function as a portable wi-fi hotspot (e.g. for use in the car or for use whilst you’re travelling abroad on holiday). A mobile wi-fi hotspot can also be useful if you have a locked smartphone where you regularly run out of data. 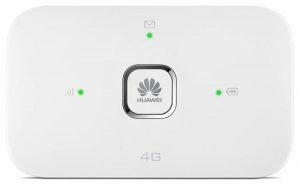 If you’re looking for a direct alternative to the Huawei E5573bs-322 Mobile Wi-Fi Hotspot, see our full guide to mobile broadband on UK networks. In the UK, Three offers 99.8% population coverage on 4G and 98.3% population coverage on 3G. If you’re travelling abroad, it’s also possible to use the Mi-Fi at no extra charge in 71 destinations. This is possible through Three’s Go Roam offer, which covers most of Europe, the USA, Australia and more. If you’re looking to access mobile broadband in a more rural area, consider getting a mains-powered device like the HomeFi. This will generally give you better coverage and higher download speeds, as well as giving you the option to optimise this further by connecting an external antenna. 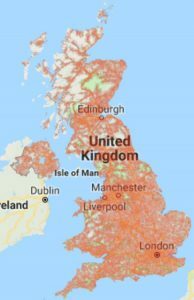 For more information about coverage on different mobile networks, see our in-depth guide to mobile network coverage in the UK. For more information about the Huawei E5573bs-322 Mobile Wi-Fi Hotspot, please see Three’s official website. An alternative portable Mi-Fi device that may be of interest to people who prefer Pay As You Go is Bitebird’s offering (bitebird.com). It works in a slightly different way than Three’s Pay As You Go price plans in that you buy a certain amount of credit (the minimum amount is €25 for which you receive €30 worth of credit) which has a validity of one year. It can be used in 141 destinations but the rate per MB varies: in Europe and many other countries in Asia, America and Oceania you are charged €0.01 – €0.03, although in USA the price of 1 MB is €0.19. The good thing is that in several countries more than one local mobile telephone provider can be used (for example in the UK both Three and O2 networks are supported). What I like most is that a modest top-up of €30 will last 12 months whereas Three’s cheapest £39.99 offer of 1GB lasts only 1 month. Bitebird uses a Huawei 4G device (similar but not identical to Three’s device) for which there is a one-off charge of €100 although periodically (e.g. in the run-up to Christmas) a discounted price is offered. Bitebird may be of interest to light mobile internet users who travel overseas relatively infrequently or are travelling to countries that are not included in Three’s Go Roam offer.